An Advanced Tool for Coaches, Therapists, Speakers, Trainers, Nurses, Teachers, Counselors and anyone in a helping profession. 15 simple, extremely effective skills and how to seamlessly weave them into an organic, client-centered RIM process. This captivating program is taught RIM-style with experiential learning, then theory and science. Take your personal and professional expansion to a higher level than ever before in your life! The next four-day RIM Essentials class will be held in San Antonio, Texas on October 18-21, facilitated by Stephanie Ellis Ecke, LPC, LCDC and Michael Kline of Intus Personal and Group Transformation. 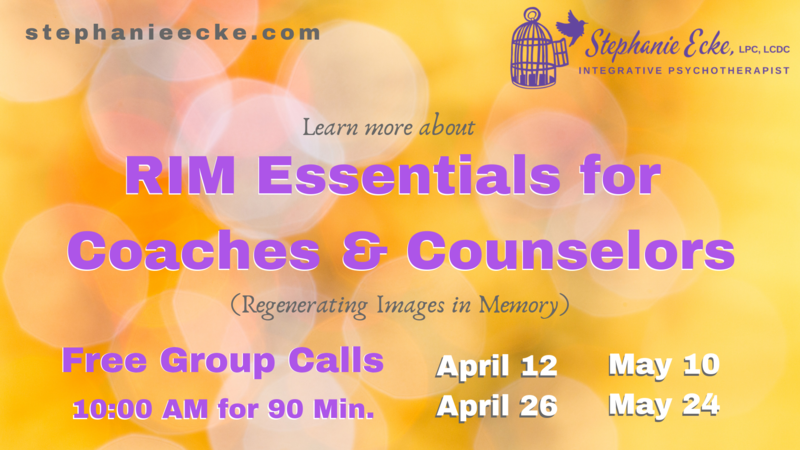 Counselors and Coaches who want to take clients deeper, identify the true underlying hidden blocks and remove them, without reliving old stories, traumas and dramas, will want to know about RIM (Regenerating Images in Memory) as an advanced coaching tool. RIM is a transformational healing system that works quickly and effectively using the body, the imagination and inner resources. For more information and to join a group RIM call, call Stephanie Ellis Ecke at 210-287-4002. ICF Coaches receive 36 CCE’s. 36 NASW CEUs offered as well! Join us on this exciting new adventure! !